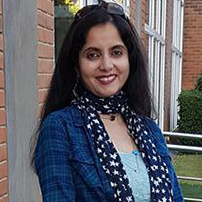 Anu Krishna is a Certified NLP Master Practitioner (NFNLP, USA), Certified Law of Attraction Practitioner (Global Sciences Foundation), Certified Diploma holder in Art Therapy (CPD) and a Certified Creative Writer (The Writers Bureau, UK). She is also Psychotherapist (World Pranic Healing Foundation and Institute for Inner Studies, Manila). She is the Karnataka Chairperson for Coaching (ALL) and responsible for making a difference in people’s lives through Coaching. Anu is also the recipient of the Shikshaka Ratna Award that recognises teachers, trainers and coaches in their field of expertise. She was recently awarded the Exceptional Women of Excellence at the Global Annual Conference of Women Economic Forum (WEF 2018). Anu has held several senior operations and marketing positions at corporates during her career, freelanced with Deccan Herald, and other publications such as Evescape Women’s magazine and this has enabled her to apply theory to practice, propel the knowledge gained to results and engage with audiences in a manner that connects with their purpose. ‘To make a difference to people’ being the main purpose, Anu Krishna, the founder of Word Weave dons the hat of a Personal Transformation, Happiness and Health Coach through one on one coaching sessions that take her clients into a journey of self-discoveries to have tremendous breakthroughs. Group coaching sessions are where she deals in a variety of powerful and meaningful topics for her participants as she watches them peel the layers of the mysteries of their emotions and break through their fears and self-limiters to create a life that they want. The focus is mainly on helping people reach out to their inner resources and help themselves to lead a happier and healthier life applying the concepts of Positive Psychology and Mind and Body connection. In her workshops and sessions, she uses Guided Imagery, Energy Work, Art therapy, Writing Therapy, Meditation and various aspects of NLP so people can work towards getting un-stuck from their current state and move to a desired state of happiness. Through Word Weave, she puts years of experience to help people re-create themselves by building powerful identities in their professional and personal lives as they lead from a space of freedom and strong intent. She runs workshops for entrepreneurs, corporates, teachers, parents, professionals, individuals and students. She keenly works with people on Heath Management and Personal Wellness that is so core to lead a peaceful life in a demanding environment. She also regularly gives talks in colleges and schools on topics such as Personal Branding, Story-Telling for business, Acing Interviews, Creating Powerful Identities, Standing up to Fears, Powerful Communication, Gender Collaboration, Belief Continuum, DREAM BIG and many more that are relevant and important to the students. A strong believer that the ‘YOUTH ARE THE FUTURE LEADERS’ has propelled her to work closely with them, so she is able to guide them to create a life that they want devoid of fears besides nudging them to ‘Dream Big’ and go after it with a powerful identity and a stronger purpose. Her keenness to make a difference to people has seen her collaborate with companies and people with similar intent by creating meaningful and impactive programs and has impacted over 1000 people in the past few years.